The corneal quantum efficiency of the eye was evaluated by comparing perception of a test chart using dark-adapted vision, with the perception of the same chart using an I-SIT TV camera and a monitor. Monochromatic radiation was used for the test. Irradiance of the scene was balanced for the two perception methods so that the same chart information was observed in both cases. 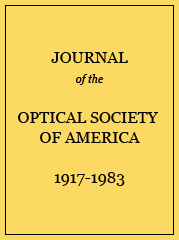 The quantum efficiency of the eye was then deduced from the ratio of the two irradiance levels, the apertures of the eye and of the camera lens, and the quantum efficiency of the first photocathode of the I-SIT tube. Several subjects were tested; the results showed the quantum efficiency of the eye to be in the range 1% to 4%. The experiment was limited to radiation levels equivalent to starlight and two orders of magnitude higher. Experimental data showing the range of photocathode irradiance over which spot detection on the monitor was independent of spot-image size. The lens aperture diameter in this experiment was maintained at 15 mm. Reciprocity failure indicates the nonvalidity of the assumption that limiting noise is solely determined by the photoelectron current. Pupil diameters of the participants in the perception test. Scene irradiance was 15 μW m−2 of 533 nm monochromatic radiation. Typical data derived from the direct observation of the test-chart and from the observation of the TV monitor.a Observer E.
a The I-SIT camera lens was set at f/1.5, 22.5 focal length. Lens aperture was 15 mm.